In May of 2008 I attended my first Traditional Latin Mass. The Holy Sacrifice was offered by a priest with no deacon or subdeacon and with just one server assisting. The altar had only two candles adorning it. As this was a Low Mass, the church was filled with the sound of sacred silence. Despite this simplicity the liturgy was still profoundly beautiful. Nearly a year earlier, in July 2007, Pope Benedict XVI had issued the motu proprio Summorum Pontificum. In the months that followed fourteen priests of the Diocese of Charlotte received training in the Old Rite. Among these fourteen was my pastor, Fr. Timothy Reid. By May of 2008 both pastor and parish were finally ready for the return of the Latin Mass to Charlotte, North Carolina. In the months leading up I had ordered several copies of the famous “little red booklet” distributed by the Coalition Ecclesia Dei. I had also read excerpts from The Holy Mass by Dom Prosper Guéranger as well as portions of The Latin Mass Explained by Msgr. George Moorman, all in an effort to better understand this ancient liturgy of the Church. Truth be told, however, reading books and watching You Tube clips can only go so far. Ultimately it is only through our presence at the Latin Mass that we can begin to appreciate this great mystery. At the outset there were several things which immediately caught my attention. Since this was a Low Mass, everyone knelt beginning with the prayers at the foot of the altar and continuing until the reading of the gospel. This change in posture from what I had always experienced at the Novus Ordo was extremely powerful. Kneeling to receive the final blessing at the conclusion of the Mass also seemed a better means of communicating the dignity and sacredness of the ministerial priesthood. It may well be that kneeling is alien to modern culture — insofar as it is a culture, for this culture has turned away from the faith and no longer knows the one before whom kneeling is the right, indeed the intrinsically necessary gesture. The man who learns to believe learns also to kneel, and a faith or a liturgy no longer familiar with kneeling would be sick at the core. Where it has been lost, kneeling must be rediscovered, so that, in our prayer, we remain in fellowship with the apostles and martyrs, in fellowship with the whole cosmos, indeed in union with Jesus Christ Himself. The next thing that caught my attention was the silence. Blessed silence. It was like nothing I had ever experienced before at Mass. The silence was broken at times by the most amazing and transcendent sound: a priest quietly offering prayers in Latin at the altar, Ad Orientem. Since most of us present had never been to a Latin Mass before, the silence was occasionally disturbed by the sound of pages quickly turning in those little red booklets as many felt obligated to follow every word. However, just as many were content to simply participate through their own prayers and attentiveness. Finally, this was the first time at Mass that I had ever received the Holy Eucharist on the tongue while kneeling. This moment, more than any other from that first Latin Mass, stands out in my memory. As Father administered Holy Communion to each of us he made the sign of the cross with the consecrated host and said, “Corpus Domini nostri Jesu Christi custodiat animam tuam in vitam aeternam. Amen.” (“May the Body of our Lord Jesus Christ preserve your soul unto life everlasting. Amen”). Receiving in such a manner was a thorough catechesis in itself regarding our Lord’s Real Presence in the Holy Eucharist. It has been over seven years since that first Traditional Latin Mass. During these intervening years I have continued to grow in my love for the Sacred liturgy in large part due to my exposure to the Latin Mass. This form of the Roman Rite is a sacred treasure of the Church which must be shared with the faithful who yearn for the transcendent. I know a lot of people feel too intimidated to come because the Mass is in Latin, and they worry they won’t be able to understand. For this reason, we have worship aids that have both the Latin and English translations to make it easy to follow along. But I would also note that the Mass speaks to our entire person. Even if our brains do not understand every word being said at the Mass, our souls do! 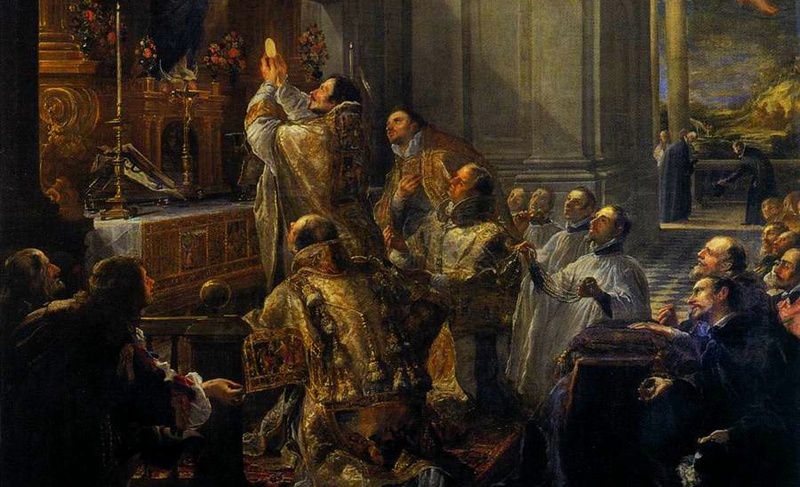 As more of the faithful discover the Latin Mass, many soon come to realize that it does indeed “speak to our entire person.” The mystery of Latin, the sacredness of silence, and the humility of kneeling effectively communicate to those present the supernatural liturgy in which they have entered into. This then leads to a greater understanding of the purpose and meaning of the Mass. In the years to come, let us pray that more and more Catholics are introduced to the faith of their fathers through the Mass of the Ages. An earlier version of this article was originally posted on November 14, 2013. Posted on November 15, 2015, in liturgy and tagged Charlotte, diocese of charlotte, fr timothy reid, latin mass, st. ann catholic church. Bookmark the permalink. 6 Comments. If one knows the Mass in the vernacular, IT’S THE SAME MASS! The “worship aids” can help to understand the differences in prayers, etc. Mostly, I don’t know all of the Latin (although I’ve been singing Latin for over forty years), but I can pray the majority of the prayers quietly to myself in English, or just absorb the ritual and holiness, realizing that the Mass IS THE MASS! Sometimes I attend a low Mass, sometimes a higher, sung Mass. BEAUTIFUL and HOLY! Just wanted to say: Love your sight and your articles!! Keep up the great work! Thank you Analee! I sincerely appreciate your kind words. Thanks be to the Truine God for this reverent and orthodox Catholic web site. I attend the traditional Latin Mass [Solemn High, High Mass, Low Mass] exclusively, receive the Sacrament of Penace in the traditional Latin rite, and study the Baltimore and Roman Catechisms regulary. Also, the Eastern-rite Divine Liturgies are magificant and beautifully reverent, worth attending in the absence of the traditional Latin Mass. Ave Marie! Thank you Michael and I agree with your sentiments. I attended a convent boarding school in the early sixties where we had the Latin Mass daily and I knew all the responses in Latin. There were no altar servers since it was a girl’s school and girls don’t serve a Tridentine Mass but we did all the responses that an acolyte would have said. We also learned the Latin chant for Sunday High Masses. I still remember them . I was not Catholic when I first went to the school but the beauty and reverence of the Mass attracted me and through it God gave me the gift of faith and I converted at 14 years old. I am happy to be able to attend a Tridentine Mass twice a month in another parish now. My own parish is N.O. and is very liberal where is seems that nothing is sacred because there is no reverence.